Address formerly 1 Sidney Street. ** The photograph on the 3rd January 1911 depicts the Rising Sun at the corner of Sidney street and Stepney way. while Scots Guards (from the Tower of London) fight heavily armed Latvian anarchists, holed up in number 100. The events were filmed by Pathe News and shown in cinemas the next day. 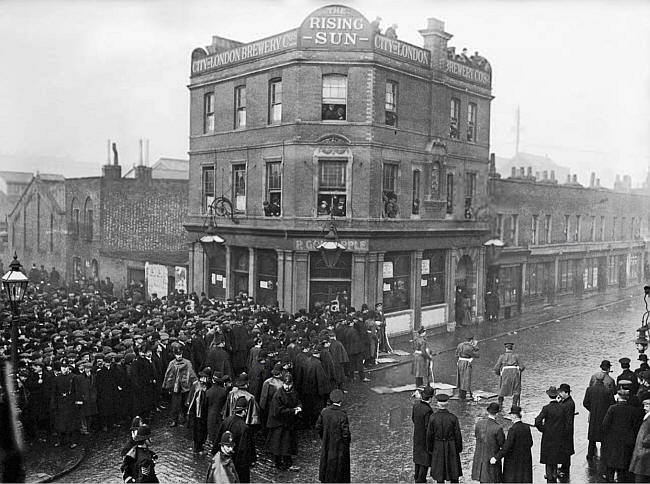 Rising Sun, 87 Sidney street & Stepney way, Mile End E1 with landlord P Goldapple, during the famous Siege of Sidney street. Phillip Goldapple moves as licensee to the Fountain, at 86 Jamaica street by 1916; where he morts two year later. His wife and then sons continue the trade there for the next twenty five years until about 1941. His son, Harry Goldapple, also ran the Knave of Clubs, Bethnal Green from about 1934 until 1961; when his son is still trading there several years later.